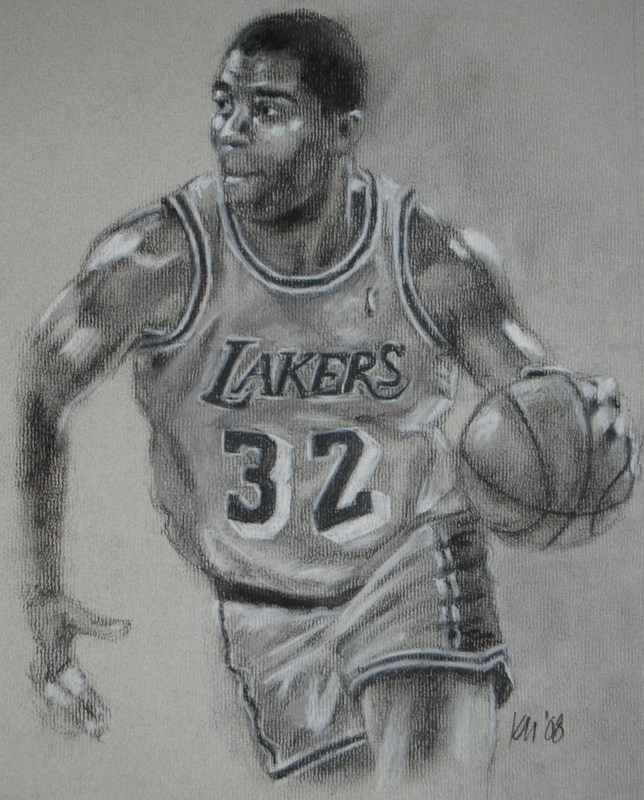 I recently completed this picture for someone who is going to give it as a gift, and when he approached me about doing it, he first asked me if I’d even do a drawing of Magic Johnson. An understandable query, but I’m not really hung up on that kind of stuff. In my younger days, back when I was a lot more passionate about individual players and thought that they were inextricably tied to the hometown team and the city, I might’ve had an issue with it. Maybe not even then, though, at least not with Magic; every Celtic fan knew that Kareem was the real douchebag on those Lakers teams, anyway. I don’t even have a “favorite player” anymore, so I really can’t summon up enough vitriol to have a most hated villain. The only player in any sport I’ve ever felt some sort of spiritual connection to was Yaz, and that’s only because I was a kid, and he was the Sisyphus who so clearly embodied the Sox during my formative years as a baseball fan. He wasn’t even the best player on the team by the time I started to get into the sport… Rice and Lynn were clearly superior, Evans was in the process of developing into the force he would become, Fisk provided as much offense at a position where production comes at a premium. But Yaz was the elder statesman, and I was naturally deferential to that. I equated him with my father; he was my father’s player, so I wanted him to be mine, too. Even as a child I was buying into the mindset that the older generations of players were better than the newer ones, despite knowing so little about the sport at the time. It just felt like Yaz had some sort of authoritarian legitimacy about him. Or something. Maybe I just wanted a common bond with my dad. Once Yaz retired, I was in a strange new world as a fan. I was thirteen years old and without a favorite player. Who would fill that vacuum? Nobody, it turned out. I was already at an age where no player would ever be a hero to me, no matter how good he was. I was aware of the fact that they were people who were paid by the team to play, and while I could appreciate their skill and feats of athleticism, I never really felt connected with them. Plus, even when removing the pragmatism from the equation, immediately after Yaz there was nobody on the Boston scene who could inspire or evoke that kind of emotional bond, except for Larry Bird. But to me, Bird was almost freakish in how everything he did worked; how can anyone identify with that? Yaz, on the other hand, was like a talented Charlie Brown. I felt like he was one of us, only better through sheer force of will (as opposed to being touched by God like Bird, or Ted Williams, for that matter). Wade Boggs was a little too selfish. Clemens originally fell into the Bird category, then he started to seem a little unhinged, neither of which make for a connection on spiritual grounds. At least not with me. Funnily enough, Ray Bourque was about as regular as you could get, yet boringly so. Unlike Yaz, there was no Greek Tragedy to Bourque’s storyline, no feeling that he was Batman as opposed to Superman. He was a tweener. He was close to Bird’s level of proficiency in terms of skill, but lacked the swagger and the killer instinct. He was a nice-guy replicant. Cam Neely? Neely was the guy everyone in Boston should have been worshipping. The owner of a scorer’s nose for the net coupled with the lightning fists of the hardiest goon, Neely was a god, but only among the puckheads of the town. A demographic that was larger than most cities’ at the time, but still not big enough. And then it all ended way too early for Cam. Which brings up the only guy I’d never draw. Ulf Samuelsson. Not that anyone would ever want a picture of him in the first place, unless it was a Boston fan who wished to see a simulation of him being disemboweled by ravenous pigs. Shortly after Neely retired, Clemens and Mo Vaughn left town via free agency, and after that, it wasn’t too difficult to remain detached about who was wearing the laundry. Pedro was the closest, but he was so prideful that I knew there was going to be a split somewhere down the road. Which is fine, that pride is what made him the pitcher he was. I’ve switched companies several times in my career, I’m certainly not going to begrudge anyone else for doing it. Usually it’s the doublespeak afterwards that pisses me off, but if press conferences were held every time some regular guy took a job elsewhere, they’d probably sound very similar. So if I feel no transcendental bond with the players on the teams I root for, I really don’t hate any opposing players, either. Aside from Ulf. Or maybe Bill Laimbeer. But Magic? Nah, no problem. I’ll even draw old Yankees without any hesitation, guys like Ruth, Gehrig, DiMaggio and Mantle. I’d do a Reggie Jackson or Ron Guidry if the price was right. I’ll generally avoid any post-1996 Yanks*, but that has more to do with their recent fan base than the players themselves. In a vacuum I think Jeter is (or was, anyway) very good player. He’s just not the Messiah he’s made out to be by Yankees fans (similarly, I genuinely like Peyton Manning as a player, but I can’t stand the people who never saw fit to mention Brady’s name in the same breath as his). It’s kind of weird to feel so blasé about it all. I feel like Mr. Glass in Unbreakable. Maybe all I’m looking for is a worthy nemesis. Is that too much to ask? *The exception being that I’d love to do a Paul O’Neill drawing, with his whiny constipated face all contorted as he threw a bat or bitched about a call or took a swipe at a Gatorade cooler. Commentary, if you will.